Homebrewers have long struggled with the issue of what to do with all their bottles once they’ve been emptied and it’s time to dry and store them. 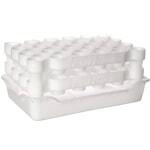 These need to be stored in such a way that A) doesn’t eat up all your available space and B) is safe, secure and convenient. Until now the available options have not been ranged from bad to worse, but in recent years, beer bottle drying rack devices have appeared that are affordable, compact and durable. Most are also dishwasher-safe, so you save on hassles when it comes to cleaning up as well. 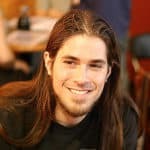 As most of us here are homebrewers, this is an issue with which we have plenty of experience. And so, below we present our picks for the three best drying racks on the market today. If you prefer to bottle your homebrew, you need a safe, convenient way to store these after you wash them. Below are the three best drying racks available today. This product takes many forms these days but none exhibit such commonsense simplicity and efficiency as the FastRack variant. This is without a doubt the easiest way we’ve seen to dry and stack your newly cleaned bottles. While bottle trees are great, they all leave these hanging outward where they can be bumped into with potentially very unpleasant consequences. Not the FastRack drainer and rack. 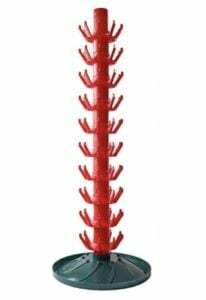 The FastRack is the first legitimate alternative to the popular drying tree. But it’s not just an alternative, it’s actually a step up in both convenience and safety. It’s more convenient because it doesn’t devour counter space the way drying trees can. Remember that when you use a drying tree, you need to allot space not only for the tree and the containers, but you also need to ensure there is a safe zone around the tree so that people are not likely to come in contact with the protruding bottles. That’s not an issue with the FastRack. This innovative system also allows you to stack up to five FastRacks at a time. And the best part is that the more you stack, the greater the integrity of the stack. 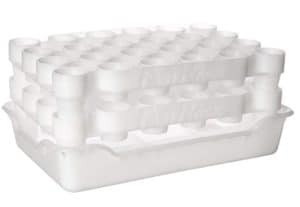 Provided of course that you’re stacking the same type of containers and not of different shapes and size. 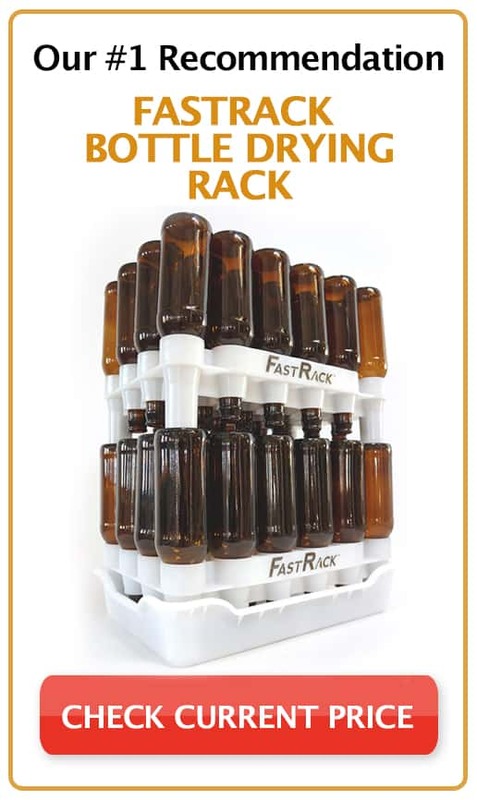 If you operate a small to mid-sized homebrew operation the FastRack variant is the ideal system for drying and storing beer bottles. Takes up far less space than standard tree-style racks. Completely stackable. Stacks up to five FastRacks on top of each other. Stores beer, wine or liquor bottles safely and securely. 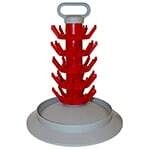 While the beer bottle tree is far from perfect technology, there are nonetheless some that are markedly better than others in build quality, convenience and safety. The Home Brew Ohio 45 variant is one of those. 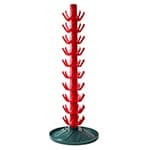 This durable, well-designed drying tree can hold nearly four dozen bottles at a time and, even better, it allows you to safely and effectively move these to and fro quickly and safely by way of the durable, comfortable top handle and the wide secure base. Each layer of the Home Brew Ohio 45 holds up to nine standard beer bottles and can help you streamline your cleaning, sanitizing and racking. When you’re in between brews, it will provide a first class method for storing your containers away in a safe and compact manner. Some fear a device like this will be unwieldy or too heavy to lift when it’s full. But the fact is it’s neither. As long as these are fully and properly loaded, lifting and transporting the rack is easy for any normal-sized adult. At the end of the day, if we had to pick one mid-sized drying tree, it would be this one from Home Brew Ohio. Dries up to 45 standard beer bottles at one time. Drainage tray carries away water to facilitate drying. Convenient carry handle lets you move the rack even when full. Bottles protrude so be careful working around it. Not great if you have young kids. Our final beer bottle rack is this product from Midwest Homebrewing. Mid-sized home breweries need a simple and effective method for storing all their bottles, and having a product from Midwest Homebrewer on hand is one of the best ways yet devised to do that. The setup here is completely modular so if you only need to store a few dozen containers just remove the upper levels. This product also accommodates most standard wine bottles. Although if you’ve got 90 wine bottles on the tree, we wouldn’t advise moving it too far or too fast. The Midwest Homebrewing variant is constructed from high quality, high strength plastic that’s also dishwasher-safe. It will bring flexibility and organization to your homebrew operation, and for that it’s worth the investment and then some. Dries and stores up to 90 standard beer bottles at once. Removable sections lets you customize the height. Not as stable when loaded with wine bottles. Drying racks and drainers are fast becoming must-have equipment for any home brewery that produces more than a few gallons of beer at a time. 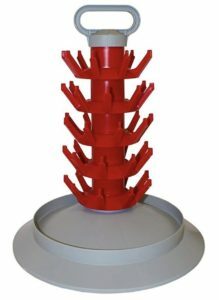 And among the many fine drainers and racks on the market today none is as convenient, safe and compact as the FastRack Bottle Dryer Rack. It’s our best choice because it approaches the issue of drying and storing clean bottles in a new way that solves the inherent conceptual weaknesses of the dryer tree head-on and proposes a new, and yes better, way of addressing the problem. It’s an affordable, common sense design winner and our choice for best drying rack.